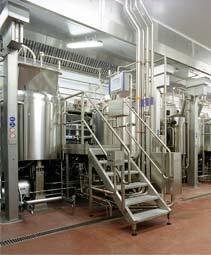 The food and drink manufacturing industry actually comprises over 30 different industries. These include slaughterhouses, meat, poultry and fish processing, grain mills, maltings, bakeries, sugar confectionery, fruit and vegetable processing, oils and fats, margarine and edible oils, pasta, baby foods and dairies. Drinks manufacture includes production of soft drinks, beer and cider production, wines, spirits and and whisky distilling.